graphic expression of the affinity of hemoglobin for oxygen as a function of the partial pressure of oxygen. Dissociation is influenced by pH, temperature, and carbon dioxide pressure. Formerly called oxyhemoglobin dissociation curve. Oxygen saturation curve Physiology A curve that describes the relationship between Hb O2 saturation and tension; defined by a sigmoid curve which reflects the interaction of the 4 Hb molecules involved in O2 uptake, transport and release; a 'right shift' of the curve indicates ↓ Hb affinity for O2, as occurs in ↓ pH–ie, acidosis, ↑ temperature, ↑ PCO2, while a 'left shift' indicates ↑ O2 affinity with ↑ pH, ↓ temperature, ↓ 2,3 DPG and ↓ PCO2 Right shifts Acidosis, hyperthermia, alveolar hypoventilation, anemia Left shifts Alkalosis, hypothermia, hyperventilation, carboxyhemoglobinemia, hypophosphatemia, ↑ fetal Hb. See 2,3 DPG. Fig. 242 Oxygen dissociation curve .The characteristic S-shaped curve of oxygen dissociation. a curve derived from plotting the percentage saturation of blood with oxygen, against the oxygen tension (the oxygen exchange). The curve is S-shaped and shows that HAEMOGLOBIN has a high affinity for oxygen.Blood can become saturated at relatively low oxygen tensions, but a small drop in oxygen tension brings about a big fall in the saturation of the blood. If tissues use up oxygen, then haemoglobin responds by giving it up. Where CO2 is present, haemoglobin has to be under higher oxygen tension in order to become fully saturated. However, under these circumstances it releases O2 at higher oxygen tensions. CO2 affects the efficiency of oxygen uptake by haemoglobin but increases its efficiency in releasing it. The oxygen-carrying capacity of blood is also affected by pH (see BOHR EFFECT). The effect of blood transfusion on the haemoglobin oxygen dissociation curve of very early preterm infants during the first week of life. CO can displace oxygen and lead to the shifting of the oxygen dissociation curve to the left. Additionally, with the increased RBC 2,3-DPG the oxygen dissociation curve shifts to the right indicating a facilitated release of oxygen to the muscles. On this occassion I also would like to emphasize that methylenblue (1-2 mg/kg in 1% solution; in higher concentration and doses causes and or increases methemoglobinemia) should be preferred in acquired as well as hereditary enzymopenic methemoglobinemias, since it is effective within minutes with corrected oxygen dissociation curve. 50] indicates a rightward shift in the oxygen dissociation curve, i. Second, methemoglobin results in a leftward shift of the oxygen dissociation curve causing normal hemoglobin to bind oxygen more tightly and preventing the oxygen from unloading freely at the peripheral tissues (8). 3+] ferric haems paradoxically exhibit increased oxygen affinity, causing the oxygen dissociation curve to be shifted 'to the left', which further impairs oxygen delivery to the tissues (Fig. This is known as cooperative binding, and is the reason for the sigmoid shape of the oxygen dissociation curve. Of the 10 knowledge questions, 3 concerned the oxygen dissociation curve. 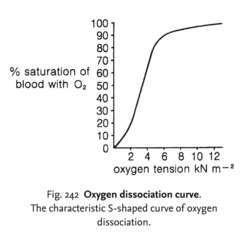 Owing to the sigmoid shape of the oxygen dissociation curve arterial oxygen saturation is an insensitive reflection of arterial oxygen tension. This haemoglobin polymer has an oxygen dissociation curve that is right-shifted with a P50 of 43 mmHg, compared with 27 mmHg for human haemoglobin. Haemoglobin solutions--where are we going? Oxygen binds cooperatively to Fe(II) hemoglobin, as depicted by the oxygen dissociation curve (ODC) shown in Fig.